I am honored to have assisted Carolina Actors Studio Theatre with thier 2011 fundraising campaign, "Save Me A Seat". I developed a logo for the campaign and created an upscale appeal package, which will go out next week with handwritten notes from Board members (on new stationery featuring the CAST logo). With direction from Michael Lawing of Full Gallop Events, we selected a charcoal grey / midnight blue color scheme and beautiful metallic papers for the envelopes and belly band. A label with the theatre's logo and new address were used as seals for the rear of the envelope, and to address the reply envelopes - a cost-effective, time-saving addressing solution that leaves a stack of labels for future theatre needs. 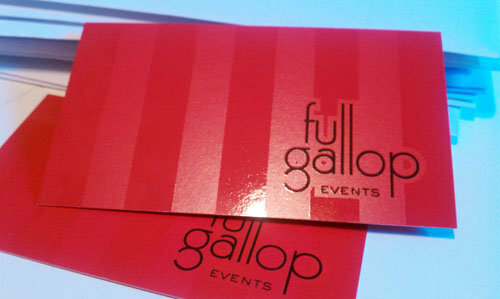 Michael Lawing, multi-talented Friend / Bookkeeper / Event Planner, called upon me to dress him up with a shiny, new logo and business card for his shiny, new business venture, Full Gallop Events. He will be handling events for CAST theatre and made his event guru debut with this week's production of Steambath. We used a Spot UV coating on his business card to give the red stripes some texture. The backside, all red, contains his contact information.